Hello! I just realized it's almost mid-August and I haven't posted anything here yet! It was (and still is) an extremely busy month for me at work, all the extra time I have, I devote to sleeping and reading manga to relieve stress until I fall asleep. Hehe. (I've finished Hirunaka no Ryuusei, Ao Haru Ride and Hibi Chou Chou, and currently reading Tonari no Kaibutsu-kun and Tsubaki Chou Lonely Planet! Any recommendations?) Of course, I still manage to reply to blog comments, tweet and post photos in Instagram, but 95% of the time, my mind is just too fried to complete an entire blog post. Despite being so preoccupied the past two weeks, I managed to squeeze a few things in between. But I guess, I have to stop for the mean time. I'm loaded with write-ups to finish! One // Two. I succeeded convincing my parents to finally push through with the over-the-weekend staycation at Hotel H2O. I even brought my laptop there because I really wanted to write but we ended up buying tickets for Manila Ocean Park and spent an entire day roaming around. Have you been to Yexel's Toy Museum there? I gasped at the sight of the Storm Troopers! In the end, I didn't get any work done but I'm still happy I get to see up close a nautilus and penguins! Three // Four. 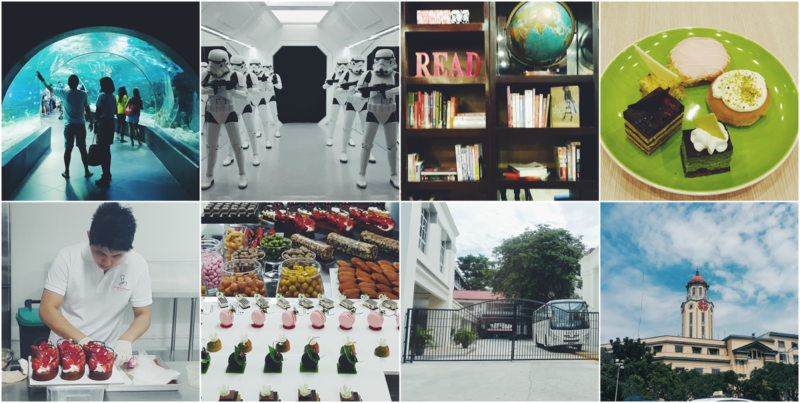 I also went to Book & Borders Cafe's grand opening in Tomas Morato a few weeks back. It's perfect for bibliophiles because they have a wide range of contemporary books. The desserts that they offer were delicious. So good. I swear by it! I'll be writing about them for another website, that I hope I finish before this week ends. Hope to be back there again with friends! Five // Six. Seriously thought of taking a sabbatical for 6 months to enroll at Academy of Pastry & Bakery Arts which officially opened last August 5. I have never ending love for sweets and being there, watching the magic happen, was exceptionally inspiring and motivating. I was only able to taste the eclairs because I had to leave the event early for work but damn, those were great! I can't wait for our chocolate-making weekend there this September! So there you have it. Just a very quick update on how things are going right now. I wish you guys are having the best time as well! Things at work would be a bit mellow starting next week so I think (and I really hope) I would finally have time to finish everything in my Drafts folder. Before we know it, August is over and the ber (and brrrr) months are here. Then it's time to bring out the Christmas decorations once again! (Also, I have to turn 29 first. HAHAHA.) Why is everything so fast right now? Help! I need an extra day for my weekends!